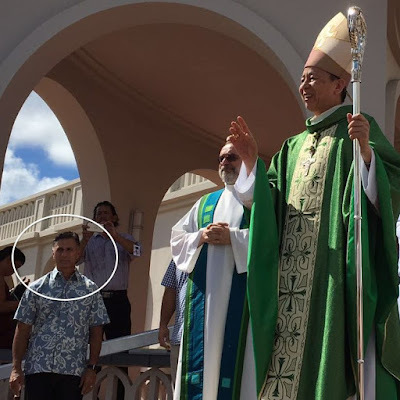 Archbishop Savio Hon Tai Fai greets Catholic Protesters in Guam from Undercover Neo on Vimeo. Archbishop Hon, you missed the boat! Readers, Pacific Daily News has another survey poll out. If you want to send a message to AB Hon about his plan to unify Guam's Catholic Church,get online and vote! i hope and pray that the laypeople's efforts will be successful in bringing justice to all perpetrators--no matter where they are in the church hierarchy! the hierarchy obviously cares only about protecting its own old men, even after many years of this ongoing worldwide scandal. enough of that crap. let the guilty spend the rest of their lives in prayer and penance--in jail.